The other week, I suddenly realised it had nearly been a year since I'd last seen my family friends Uncle Mike and Aunty Helen, and swiftly issued an invitation for dinner. I also thought it would be the perfect opportunity to try out a full-on British roast beef dinner that I'd been wanting to do since, well, forever! 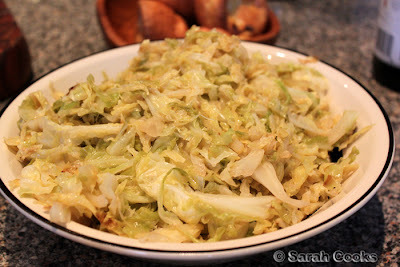 Savoy Cabbage "the best way"
The above recipes are all from Nigella's Feast, although various incarnations of most of those recipes appear in other books of hers. 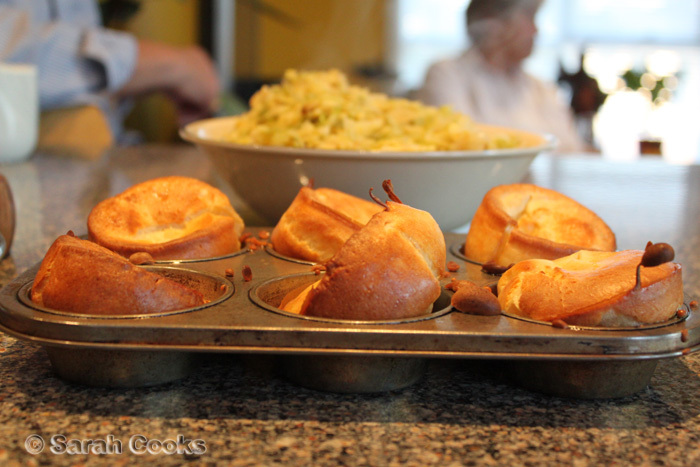 In Feast, she refers to it as the Ultimate Sunday Lunch. Who am I to argue? The beef in question was a gorgeous organic beef rib from Rendinas Butchery. Beautiful! We bought all the ingredients the day before, and then made our way over to Mum and Dad's place on Sunday arvo and spent the whole afternoon cooking. Let's have a look, shall we? 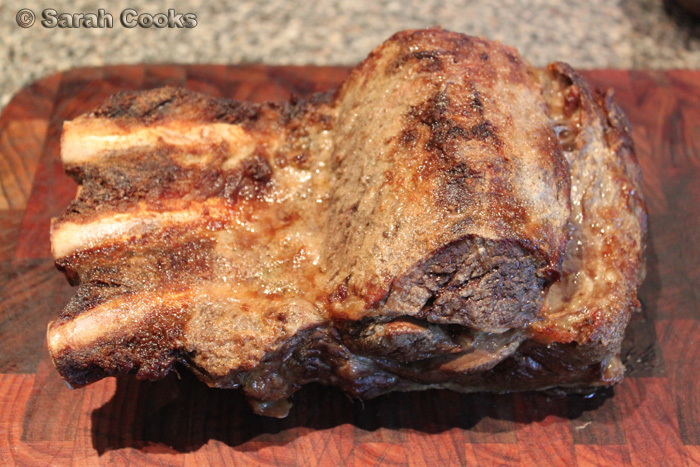 I rubbed the beef in a mixture of garlic oil, porcini powder and mustard powder, for extra deliciousness. Now, the all-important side dishes! Nigella's recipe for savoy cabbage is simply stir-fried with a bit of stock and other flavourings. It complemented the rest of the menu well, but was a bit boring on its own. I must admit, I only made the cabbage to be a bit healthy, and to try the complete menu. But now we get on to the fun sides! 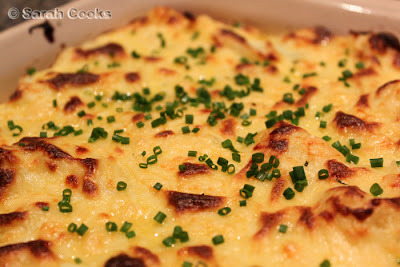 I frikkin LOVE cauliflower cheese. It's so easy, and now I want to make it all the time. Just blanch the cauliflower, make a white sauce, add unholy amounts of grated cheddar and bake it! It goes with everything. However, when you make it yourself, you see (there's no way you can avoid it), just how terribly rich and unhealthy it is. Small portions, small portions! You may remember that I had a wonderful cauliflower cheese at the Black Cow Bistro in Launceston, from whom I took the idea of sprinkling chives on the top. 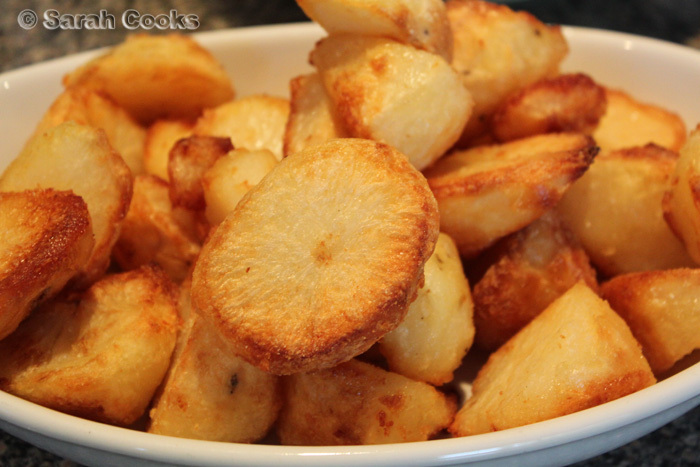 Nigella's recipe for roast potatoes. Still the best. This time, I eschewed the goosefat for slightly healthier olive oil, and they still turned out well. You don't get the artery-clogging tasty coating, but they're still crunchy outside and fluffy within. 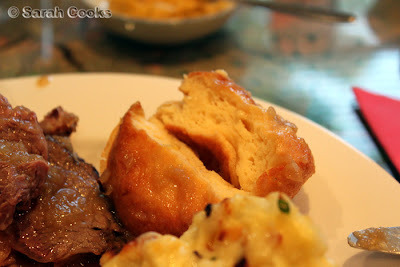 Yorkshire puddings are also super-easy to make, but I've only ever made the savoury version once before. 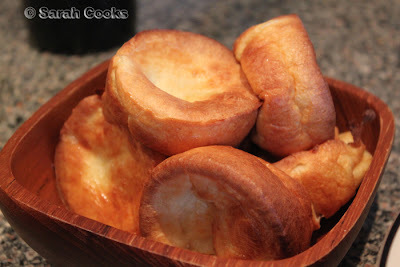 I just can't go past a sweet Yorkshire pud, whether it be plain with golden syrup and ice-cream, or studded with apples. The savoury version, however, is perfect Sarah-food - crunchy on the outside, and mega-doughy on the inside. Mmm.. stodge. Interestingly enough, after sitting around for a little while, the slices lost their pinkness and became more brown. I'm not sure if it's because they were continuing to cook, or if it was a reaction with the air. Ideas? Not pictured but most definitely eaten were a marsala-onion gravy, and a horseradish sauce. Nigella's horseradish sauce is a mixture of (amongst other things) Greek yoghurt, cream, horseradish and chives, and it was absolutely wonderful! I tell you, chives make everything taste awesome. 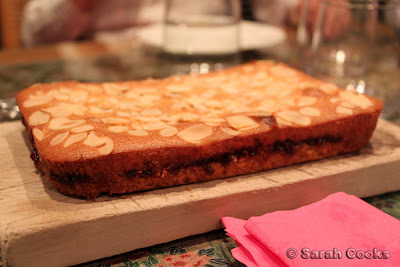 Well, after that massive meal, there isn't really room for a proper dessert, so I did the Bakewell slice in half-quantities, just something small and sweet to mark the end of the meal. Bakewell pie consists of a shortbready pastry, topped with jam and then an almondy frangipane. (I previously made a version with fresh raspberries here, and very good it was too). This time, I made it in a mini-foil barbeque tray, which means it's very easy to make (no need to roll out the pastry, just press it into the tin). 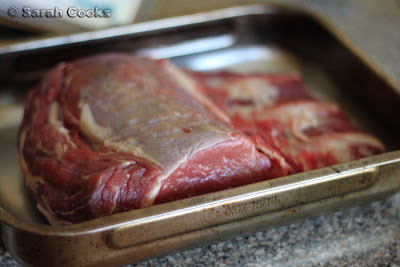 The foil tray also means that the base cooks evenly all the way through, and is incredibly buttery and crispy. 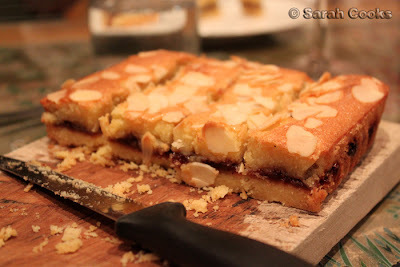 The Bakewell slice went down really well - I didn't think we'd get through more than half of it, but we polished the whole thing off! Even German Sandra, who was suspicious of this strange-sounding British dessert, loved it and had seconds. Even more exciting, Uncle Mike asked for the recipe. That means my attempt at cooking English food for an English person was a success! Yay! I spent the next week eating the most wonderful roast beef sandwiches - cold roast beef, grainy toast, cheese and horseradish cream. As if you needed another excuse to get roasting! 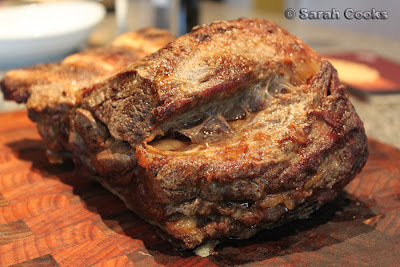 Oh God, Sarah that has me drooling and my stomach rumbling! 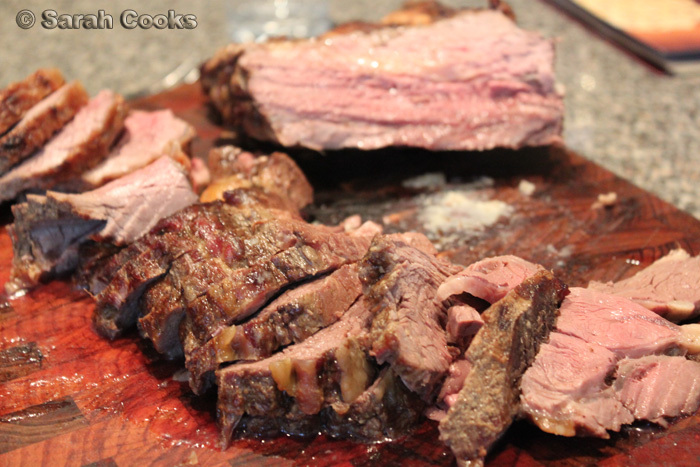 I don't eat beef but I would so love a roast meal like that regardless! I've always wondered what Yorkshire Pudding tasted like. You're such a domestic goddess! 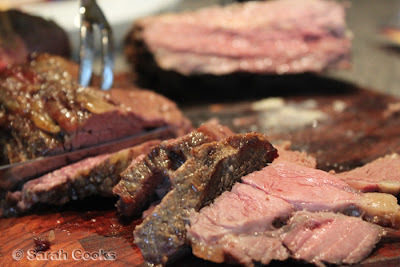 That roast beef looks wonderful - loooove the sound of rubbing porcini powder into it. 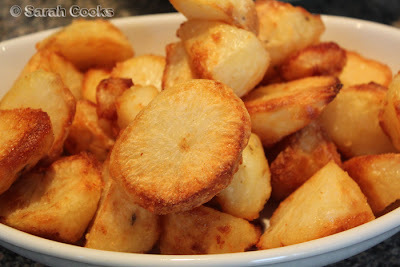 Ah, Nigella's roast potatoes. I'm sure the quantity of goose fat increases with every book! I am now inspired to roast something beef as well. Just for the sandwiches that i can have during work week. Laura - Lol you are so right! From 2 tablespoons to 2x320g jars in just 5 short books! Hannah - I agree, I love the side dishes! Penny - it is so worth it, just for the sandwiches! Anna - Thank-you very much!